This year John Fuller and I recorded and released 15 videos on U.S. criminal courts. Each video offers both a summary of some aspect of the criminal courts and a relevant controversial issue. The fourth video, for instance, gives an overview of criminal law and the controversies surrounding police searches, evidence, and suppression of evidence. The eleventh video provides a concise description of the appeal process, but then explores a debate around the core function of appeals: should appellate courts work to stop injustices, or should they merely assure that the trial followed proper procedures? 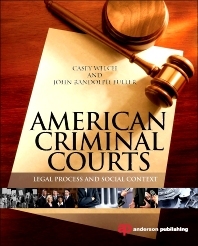 To compliment both the text and free videos, I will post blogs that untangle and clarify some of the complicated issues surrounding American criminal courts. Criminal courts are at the center of our criminal justice system, and therefore are one of the most far-reaching and graphic forms of government social control. Citizens of a democracy will be well served to learn as much a possible about this part of civil governance. We hope these videos and blog posts serve that pursuit. To watch these videos, visit the SciTech Connect YouTube page, or visit the following links individually.